It's been 7 years since I walked out of a corporate environment and one of the things I don't miss is the corporate e-mail system. NBCNews covered the move by Ferrari to limit email use in the company. One of the things I find frustrating reading articles like this is where is the Ferrari statement referenced? Many times journalists will make it appear like they talked to the company and have access to exclusive content. WSJ blog has a ahttp://blogs.wsj.com/corporate-intelligence/2013/07/05/ferraris-new-strategy-make-fewer-cars-send-fewer-emails/ that references Ferrari's statement. “The injudicious sending of emails with dozens of recipients often on subjects with no relevance to most of the latter is one of the main causes of time wastage and inefficiency in the average working day in business. The Ferrari web site looks so much cooler too. The Ferrari statement closes with the main point. 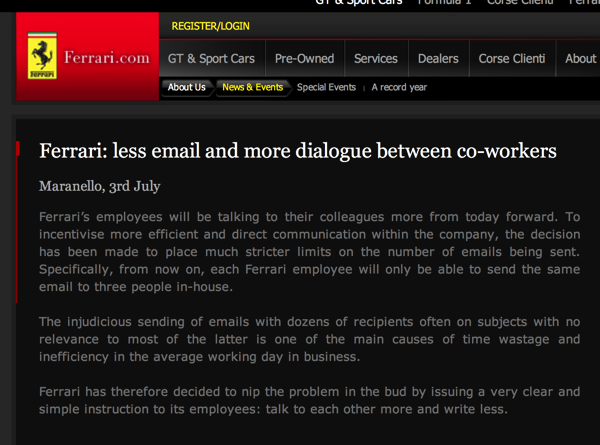 Ferrari has therefore decided to nip the problem in the bud by issuing a very clear and simple instruction to its employees: talk to each other more and write less. I would bet that Ferrari management is tired of resolving issues between departments where the groups don't talk to each other. I would agree that writing is over rated.